The Star-Bulletin chooses a monthly Golden Letter winner. The award is given to the letter writer who has best expressed his or her views in an informative, entertaining or persuasive manner. Dieter Thate of Kailua wrote February's winning letter. Dieter's letter, published Feb. 16, is as relevant today. I am not a pedestrian that often. But yesterday I was -- for a brief moment. I was on a sidewalk in Kailua walking toward the Post Office when a car sped into the parking lot toward Aaron's Dive Shop. I had to jump aside not to get hit. All it takes is more consideration toward each other. Many drivers seem to own the street and see pedestrians as a distraction. The same applies to pedestrians. As a driver, always assume there is a pedestrian or a pet on the street. And when we abide by the speed limit, we should be able to stop on time. Let's not forget what makes Hawaii so special -- the aloha spirit! Editor's note: Dieter Thate, 64, was killed on Friday, April 13, when his car crossed the centerline of Kapaa Quarry Road and crashed head-on into a semi-truck. His golden retriever puppy, Kula, survived the crash. Dieter cared about his community and was a frequent contributor to the Star-Bulletin editorial section. We will miss him. IN THURSDAY'S story "As isle development grows, old graves become obstacles," Paulette Kaleikini asked, "If these burials were of Western people, would they move them?" Sure they would. That's why you can't remember any case where "forgotten bones" (the remains of people whose names and graves have been long forgotten) having any ancestry other than "Hawaiian" have road-blocked a large project. Please note that "remembered remains" (the remains of people whose names the living remember, and whose graves they maintain) are different. Their fate is resolved before, not after, construction begins. Besides, if respect for the deceased were at issue, the focus would be on how to respectfully re-inter "forgotten bones." Not on using "forgotten bones" to pursue other goals after a contractor stumbles across them. When affected parties cannot agree on "remembered remains" during the permit process, eminent domain laws applicable to the living would be equally applied to the deceased. If "forgotten bones" are later discovered, the only obligation would be to respectfully re-inter them in land Hawaii reserves for human remains, as is required for all of today's deceased. Actually those rules are applied to "forgotten bones" of all ancestries other than "Hawaiian" today. Apply them equally to all and the problem disappears. It seems to me that ever since basketball coach Riley Wallace's contract was not renewed, there has been a witch hunt for University of Hawaii athletic director Herman Frazier's job and head. It was way past the time for a coaching change for basketball, and Wallace needed to go. Unfortunately, Frazier is the goat for something that should have taken place a long time ago. He has done a fine job, and I hope he will be allowed to continue. The Star-Bulletin's May 22 editorial, "Medical marijuana research should not be hampered," admirably argues against "absurd" federal policies discouraging science. Unfortunately, equally difficult state policies hamper Hawaii's seven-year-old medical marijuana law, and unduly interfere with the doctor-patient relationship. For instance, medical marijuana clearly is a health issue and should fall under the Department of Health, not law enforcement. Bureaucratic roadblocks faced by physicians and their patients can be eliminated. And instead of forcing sick patients to shady dealings in the black market, there must be a safe, legal source for the medical marijuana their doctors recommend for their serious illnesses. Our lawmakers enacted this program to provide compassionate care for the seriously ill. Time has revealed that changes need to be made. We urge the Legislature to act to ease the burdens faced by the more than 1,000 registered patients in the program and the untold others who would benefit from it. I was watching seven Honolulu police officers measuring drivers' speeds by radar in a school zone. They must have pulled over 20 drivers in about 30 minutes. I saw a white van traveling down the road at a high speed. An officer clocked the van and motioned the driver to pull over. Then the officer noticed it was a van labeled TheBus. He laughed and waved the driver through. That's not right at all. Drive with aloha? You're joking, right? Have you ever driven Liliha Street to Dillingham Boulevard? Aloha is rare. I'm surprised there aren't more collisions. What's with the broken turn signals? They must be broken, because not many are used. And parents, why are you risking loved ones to injuries in low-impact accidents? So what's the rush? Does anyone really care how fast things get done? High gas prices force more people to find cheaper modes of transportation. So bus drivers, allow the walkers to get past the bus stops. Allstate advertises that multi-tasking increases your chances for accidents. Stop multitasking, use turn signals and everyone will be happier -- especially me. We love the Honolulu police, but somehow the uniform makes them notorious moving violators. Everyone, be safe on the roads, because minding doesn't come as standard equipment for most of us. Can we also drive, walk, bike and bus with aloha by sharing the road and walkways, please? With National Fishing and Boating Week right around the corner (June 2-10), now would be a good time for anglers to think about taking up a more animal-friendly pastime. Tricking small animals into impaling themselves on hooks and ripping them from their homes is not sporting. I used to fish, but I stopped when I learned that fish feel fear when being chased, and pain when they are hooked in the mouth, pulled out of the water and left to slowly suffocate. And fishing doesn't just hurt fish. Countless birds and other animals suffer, and many die, from injuries caused by discarded fishing hooks, monofilament line, lead weights and floats. By all means, spend time with your families on the water this spring and summer -- boating, canoeing and rafting are just a few of the many enjoyable outdoor activities that do not involve harming animals. But please, leave the fish alone. I appreciate others who voice an opinion, whether I agree or not. Jim Saya (Letters, May 20), writing about the latest "insult" by the Democrats and the media, thinks it's oxymoronic to support our troops but not the ill-conceived Iraq war. The newly in control (legislatively speaking) Demo-crats have not "emboldened" the enemy. That was done long ago by a president who stood on the world stage and announced "Mission Accomplished" when it was far from over, and encouraged radical killers to "Bring 'em on!" Yes, I support the troops. I hope all of them can make it home safe and sound, and something good can come of the mess in Iraq. But it would take a longer letter than this to explain why my usual optimistic self is bending toward pessimism on this one. I have no problems with the Kamehameha Schools' Hawaiians-only admission policy, as many others do. However, letter writer Suzan Kauina's reasoning and justification for the schools' policy is flawed and selfish ("Only Hawaiians benefit from princess' gift," Star-Bulletin, May 20). How does she expect a culture to survive and thrive if only a select few are obligated to accept and practice it? Even the late Mary Kawena Pukui taught Hawaiiana at Punahou School. Across the nation, compatriots and mainland university students like me promote Hawaii's culture daily, and especially in annual luaus and festivals. There are those who travel halfway around the world to show off their hula skills at the Merrie Monarch Festival. And you know what? Many do not even have an ounce of Hawaiian blood in them. There are individuals who truly deserve to be on "the hill," and, sadly, some who do not. A'ole pau ka 'ike i ka halau ho'okahi -- not all knowledge is in one school. This concerns lawyer David Rosen and his war against Kamehameha Schools ("Lawyer wants clients for new school suit," Star-Bulletin, May 23). It's too bad he doesn't realize that the white missionaries in Hawaii started whites-only schools, leaving the Hawaiians to start their own schools. 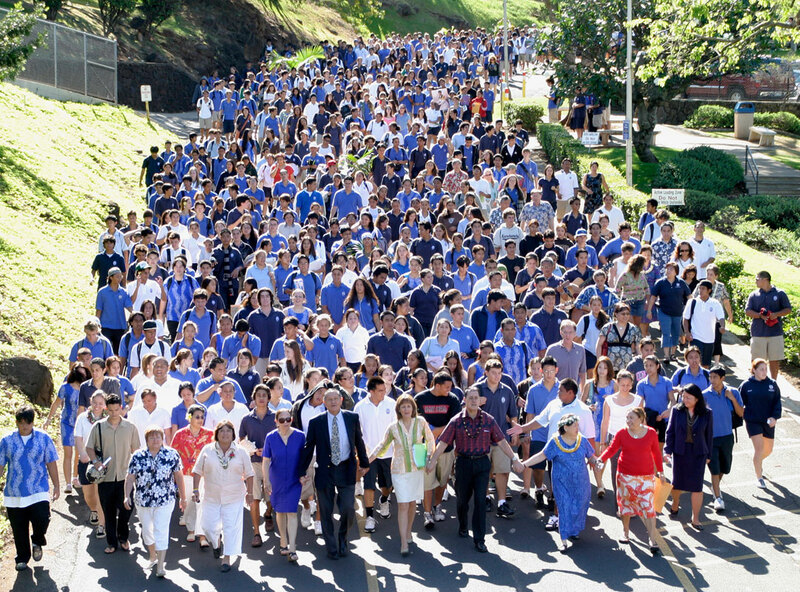 So people of Rosen's own race started the whole thing and brought about Kamehameha Schools. Sure, Rosen might get a kid into Kamehameha Schools, but are the kid or kids prepared to learn the Hawaiian language and customs, with no special treatment? As a part-Hawaiian and part-Portuguese -- in other words, I'm white -- I find it an outrage that haoles have to join whatever we join as Hawaiians, like the Office of Hawaiian Affairs. But Rosen doesn't realize the heartache he puts all haoles through; they might get harassed or worse by Hawaiians because of his actions. I wish that people like attorney David Rosen would stop trying to stir the pot in the Kamehameha Schools admissions policy of Hawaiians only. Princess Bernice Pauahi Bishop founded the school to perpetuate the education of children of Hawaiian ancestry. It appears to me that Rosen wants to make a name for himself by trying to get this issue to the U.S. Supreme Court by soliciting people to his cause. This is not a race-based issue; the princess established these policies prior to today's laws regarding race, color and creed. Don't take Kamehameha Schools away from those it was intended for -- the native Hawaiian children of Hawaii. There is not much left to take. Leave this issue alone, please.